Several members of Samford University’s baseball team were chosen in the recent Major League Baseball summer draft. 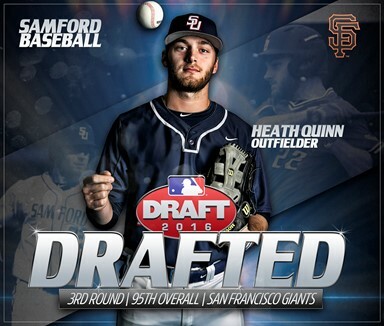 All-American Heath Quinn was chosen in the third round by the San Francisco Giants, the second highest draftee in Samford history. Infielder Alex Lee was drafted by the Atlanta Braves, and infielder Hunter Swilling was selected by the Detroit Tigers. Samford signee Austin Franklin of Paxton, Florida, was selected by the Tampa Bay Rays.